Congratulations! A radio station has taken a liking to your music and wants to bring you in for an interview and on-air performance! This is a huge opportunity to win new fans and gain valuable online content – just look at how one NPR Tiny Desk Session revitalized T-Pain’s career – and you need to capitalize on it. Here are five ways you can do that. Your fans have been listening to your studio recordings and digging them. And if the radio station wanted to bring you in, it's probably been spinning your tracks for its audience. So why give them more of the exact same thing? A fresh take on a song you're promoting will grab your fans' attention and effectively give them a new track to obsess over. Additionally, most broadcast studios only have the equipment to allow for a stripped-down or acoustic setup. Making the most of a limited instrumentation will allow your talent and creativity to shine through, as well as making for compelling video content if such content is produced. A good interviewer will have researched you and your career beforehand and will be able to ask questions to guide the conversation in such a way that keeps it informative yet entertaining. But a great interview is a two-way street, and you need to come prepared to talk about yourself in a memorable way. The real purpose of your time on air is not only to promote your recent releases, but also to get your fans to invest more deeply in your personal brand – and their investment is correlated with how well they feel they know you. Telling good, relatable stories will cultivate this connection, especially if they generate laughs, and thinking of them before you go on the air will help reduce dead time that you'd otherwise be filling with "ums." Most radio stations or podcasters are able to record their broadcast feed, and in an era when a strong online presence is necessary to a media outlet's success, they should be posting that feed on their website. Oftentimes, they'll also have someone taking video of your interview/performance that will be paired with the audio to create a high-quality product that can accrue thousands of views on YouTube. Find out where and when this content will be posted and share it with your online fanbase – they'll snap it up. That said, not every station will have the resources or wherewithal to do this, so ask beforehand if they'll be taking video. If they aren't, bring someone along to do it. YouTube is still the most frequent way that people discover music, so it's crucial to ensure that video of your on-air experience is available. Even iPhone footage will work as long as you have decent audio from the station or an iOS-compatible mic on hand. Cultivating good relationships with the media is essential to your success, even in a DIY world, because their support grants you legitimacy and a larger audience. Taking a picture with your interviewer for Instagram should be a given, but a physical token of your appreciation leaves a lasting legacy of your visit. CDs or vinyl are ideal for this, particularly because the station can then spin your music during request programs or other shows with a flexible playlist. Stickers and koozies are inexpensive giveaways that you can hand over in bunches to all the station's employees. And if you can swing it, homemade baked goods are memorable and a key to the heart of a hungry midday DJ. Zach Blumenfeld is a recent alumnus of WRVU Nashville, Vanderbilt University’s student radio station. Over the past three years, he has interviewed over 40 songwriters and bands on his weekly program, The VU Backstage, as well as contributing music commentary and reviews to the WRVU blog. 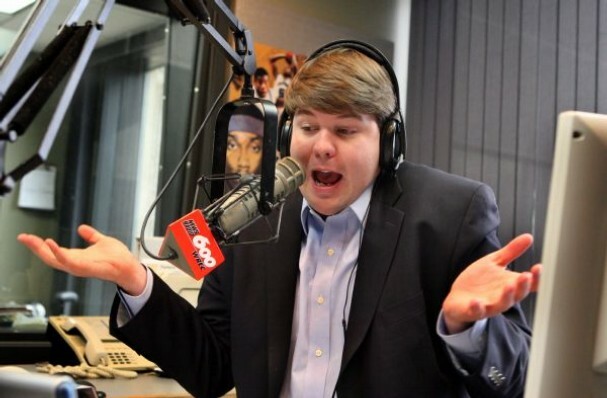 He has also worked at Nashville radio station Lightning 100. Follow him on Twitter at @ZachBlumy.